'The Last Boat Out' premieres April 21 on PBS. Join Bethesda Green for a group viewing, April 21 at Hard Times Cafe. 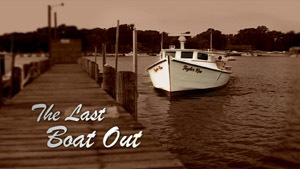 Join Seltzer Film and Video and Bethesda Green as we present the premiere of ‘The Last Boat Out,’ a PBS documentary film about the plight of the watermen on the Chesapeake Bay and the waters they depend upon. The event will take place at Hard Times Cafe on Wednesday, April 21. We’ll have a Happy Hour from 7-9 p.m. and then watch the film premiere from 9-9:30 p.m. Meet award-winning producer Laura Seltzer, socialize with the Bethesda Green community and see an amazing documentary. I was part of a contingent of Bethesda Green folks who saw the film last week at a special Congressional screening Seltzer arranged with the House Water Caucus. It’s a powerful film that depicts the human side of a declining Bay: A group of Virginia watermen who struggle to provide for their families by working the Bay for oysters, clams and crabs the way their families have for three and four generations. Squeezed by dwindling catches and tighter state regulations, the watermen may themselves be an endangered species. Seltzer also examines what’s causing the Bay’s decline, including stormwater and pollution runoff from farms and suburbs. This film brings home the fact that environmental degradation can affect people and their livelihoods. Hard Times Cafe is at 4920 Del Ray Avenue, Bethesda. See you there! KissMyCountry wrote about Laura Seltzer a few weeks ago in our posts on the Bethesda Green Fields of Green Internship Fair. We now get to know Laura better through her most recent work, ‘Last Boat Out’. Enjoy! 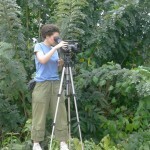 Laura Seltzer, award-winning producer and documentary filmmaker, uses her talents to help to make a difference in people’s lives. Her work has taken her many places, including foreign countries and inside the world of mental illness. Laura’s latest film, ‘Last Boat Out’, highlights the watermen of the Chesapeake Bay, whose way of life is threatened by pollution and development. For Laura, it’s a chance to make a difference that’s very personal. Laura grew up on the Chesapeake Bay and knows both the Bay and the lives of the watermen firsthand. 'Last Boat Out' premieres April 21 on PBS. Join Bethesda Green for a group viewing, April 21 at Hard Times Cafe. “I grew up boating on those waters. My family had a boat on Deep Creek . We would spend the whole summer on the boat”, Laura says. “I watched countless sunrises on the James River. The workboats would come in and you would see this gorgeous glow on the water.” When Laura learned the last local pier in Newport News used by the watermen would be torn down, she took action. “I took my camera and went down to the pier. Losing the pier meant more than a chunk of wood. The watermen grew up on the pier, their fathers grew up on the pier, and their grandfathers grew up on the pier.” Laura’s action and the cooperation of the Chesapeake watermen led to ‘Last Boat Out’, a 27-minute film. The film sparked a response among supporters even before its premiere on MPT on Wednesday, April 21. Sam Waterston asked to narrate the film after hearing about it through Oceana. The Congressional Water Caucus, interested in the water quality of the Chesapeake, organized a Congressional Viewing at the Capital on April 14–-a first for Laura and her films. “It was so gratifying to not only show my film on the big screen in our nation’s capital but to have those who influence public policy view my film”, Laura said after the screening. Bethesda Green will host an evening with Laura Seltzer on April 21 at Hard Times Café from 7-9:30 p.m. Laura, you’ve done a great job and we can’t wait to see ‘Last Boat Out’. We’ll be there at the Hard Times Café on April 21! Bethesda Green is a 501(c)3 non-profit organization located on the second floor of the Chevy Chase Bank Branch at 4825 Cordell Avenue, Suite 200, Bethesda, Maryland 20814. Bethesda Green will host a Premiere Party on Wednesday, April 21 from 7-9:30pm at the Hard Times Café for Laura Seltzer’s PBS documentary “The Last Boat Out”, about Virginia’s Watermen and the Chesapeake Bay, narrated by Sam Waterston. Suggested donation for the Premiere Party is $10 to go toward education programs for Bethesda Green and communities throughout the Chesapeake Bay watershed. Please RSVP to attend the Premiere Party to Melissa (at) SeltzerFilmVideo.com or 202-210-4689. 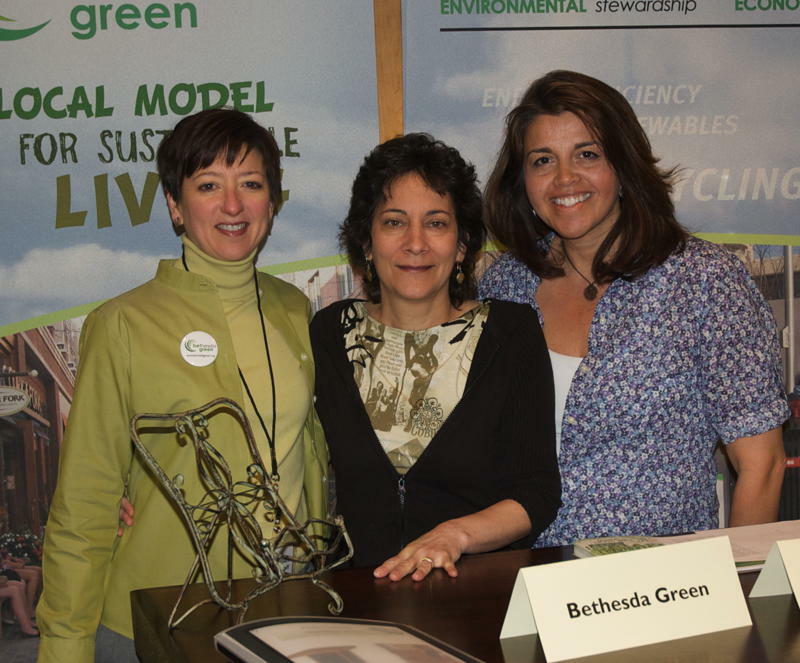 Bethesda Green volunteers Ann Dorough, Karyn Miele and Rosalie Grazzini (L-R) at the March 27 Internship Fair. Photo by Ralph Smith. Among efforts to stimulate the local economy, the inaugural Bethesda Green Fields of Green Internship Fair March 27 proved to be an exciting step in the right direction. With more than 200 young people registered to participate and over two dozen businesses, nonprofits and academic institutions exhibiting, the day-long event hosted at the BCC Regional Services Center successfully connected scores of young people into entry-level internship positions offering experience toward landing green jobs. In addition to meeting company representatives and applying for internships, attendees heard from a panel of experts — Sunshine Brosi, Frostburg State University; Amy Lindsey, Environmental Planner with Montgomery County; Anca Novacovici, Eco-Coach; Randi Steiner, Montgomery College; and Esi Waters, GreenShape — on hot new careers in Fields of Green and what qualifications are needed in the job market. Internship opportunities will continue to be listed online. And Bethesda Green will track the experience of a select number of interns over the summer. Stay tuned for a number of exciting plans for the future and the second annual Fields of Green Internship Fair next year. The Fields of Green Internship Fair was sponsored by the Reznick Group and Perfect Settings.